Lynden celebrated the 42nd anniversary of Earth Day this month by continuing its environmental sustainability efforts. The Lynden family of transportation companies has been an industry leader in reducing its carbon footprint including recent design changes in its truck fleet that have improved fuel economy by 23 percent. "Earth Day is a perfect time to reflect on the many ways Lynden is committed to protecting the environments where we do business. We were working 'green' before it became so popular," says Alex McKallor, Chief Operating Officer for Lynden Inc. "From innovative containers to equipment that requires less fuel and reduces harmful pollutants, we are constantly searching for ways to save energy and use resources efficiently. Our culture of innovation and efficiency is in harmony with our commitment to reduce waste and be a model of environmental stewardship." 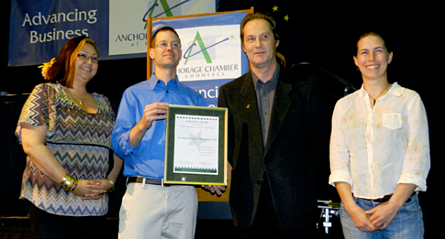 Lynden was the first transportation company in Alaska to gain SmartWay certification from the Environmental Protection Agency (EPA) and to earn the state's Green Star Award. It is on the list of Inbound Logistics' Green Supply Chain Partners and, in 2008, Lynden launched a Green Initiative stating its goals and asking employees for ideas on how to operate 'leaner and greener.' Many of these suggestions have been implemented. Most recently, Lynden company Brown Line LLC introduced an aerodynamic tractor-trailer design with side skirts and roof fairings that improved fuel economy. The design, plus other changes such as driver training, reducing speeds and new engines and tires, has helped Brown Line drastically reduce fuel consumption and emissions by nearly 25 percent. In addition to its own green efforts, Lynden supports local organizations in their environmental programs. Lynden transports recyclable paper from Anchorage to Seattle for Alaskans for Litter Prevention and Recycling (ALPAR) and moves aluminum cans from Cordova to Anchorage for recycling in support of Cordova High School's fundraising program. Lynden Air Cargo participates in a back haul program for the Yukon River Tribal Watershed Council to help clean up Alaska's village communities and Alaska Marine Lines transports gillnets for recycling in Cordova. For more information on Lynden's environmental policy and programs, visit www.lynden.com/about/green/stewardship.html. Lynden is a family of companies offering truckload and less-than-truckload freight to Alaska, charter barges, rail barges, intermodal bulk chemical hauls, scheduled and chartered air freighters, domestic and international shipping via air and ocean forwarding, customs brokerage, trade show shipping, remote site construction, sanitary bulk commodities hauling and multi-modal logistics. Lynden companies are repeat winners in the annual Quest for Quality customer service awards presented by Logistics Management magazine.